A significant outbreak of measles is occurring in the Portland area. There are more than 50 confirmed cases of measles across the river from Portland, in southwestern Washington, and 4 on the Oregon side. There are known exposures to the disease in Portland and Bend. We do not currently have any confirmed cases of measles in Lane County. What will happen if this measles outbreak spreads to Lane County? If an unimmunized student is exposed to measles, Lane County Public Health will exclude them from school or childcare to protect them and reduce exposure to others. (This includes students who have an exemption from immunizations on file.) The exclusion is usually days 7 through 21 after exposure, and this may be extended if there are further cases. Lane County Public Health also will advise any unimmunized staff members to stay home if there is an exposure. The symptoms of measles start with a fever, cough, runny nose, and red eyes, followed by a red rash that usually begins on the head or face and spreads to the rest of the body. People are most contagious with measles for four days before the rash appears and up to four days after the rash appears. 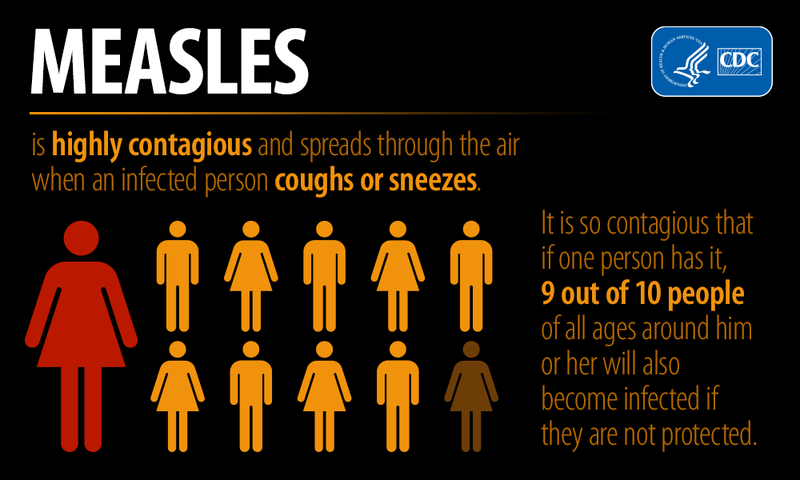 Measles is one of the most contagious of all infectious diseases. Measles is so contagious that if one person has it, 90% of the people close to that person who are not immune will also become infected. There are several hundred students in 4J schools who have not been immunized and are susceptible to measles. If exposed, these students are at very high risk for contracting and communicating the disease. The virus is transmitted by direct contact with infectious droplets or by airborne spread when an infected person breathes, coughs, or sneezes. Measles virus can remain infectious in the air for up to two hours after an infected person leaves an area. Measles is not a minor or routine childhood illness—it is a serious disease. It causes high fever and rash, and can cause severe long-term impacts such as hearing loss, pneumonia, encephalitis (swelling of the brain), and premature birth and low birth weight for infants. About 1 in 4 people in the U.S. who get measles will be hospitalized, and 1 or 2 out of 1,000 people with measles will die, even with the best care. People at highest risk for severe illness and complications from measles include infants and children under 5, adults over 20, pregnant women, and people with compromised immune systems, such as from leukemia and HIV infection. There are no confirmed cases in our area so far. Most Oregonians have been vaccinated against measles. The vaccine is proven to be safe and highly effective—about 97% effective when both doses are received. Very few people—about 3 out of 100—who get two doses of measles vaccine will still get measles if exposed to the virus, but are much more likely to have a milder illness. Immunization is the most effective measure to prevent the spread of measles. The MMR vaccine is safe and effective, and provides immunization against three diseases: measles, mumps and rubella. There is no shortage of the vaccine. It typically is readily available from healthcare providers and at local pharmacies. Any person who has not been immunized against measles is at a very high risk for contracting and communicating this serious disease if they come into contact with someone who is contagious. You’ve been diagnosed with measles in the past (confirmed with a lab test). You’ve had a blood test “titer” that shows immunity. If you or your child are not immune, or if you’re not sure, talk with your healthcare provider. Oregon Health Authority has provided tips on how to access your immunization records. Additional steps to help prevent the spread of measles and other illnesses include staying home if you’re sick, washing hands frequently, covering your coughs and sneezes, and disposing of tissue paper used for coughing or sneezing. Most importantly, if you think you or another person may have measles, STAY HOME! If a person is experiencing measles-like symptoms, they should not go to the doctor’s office. Instead, they should call their provider and ask what to do next. For more information, please visit lanecounty.org/publichealth or www.cdc.gov/measles.